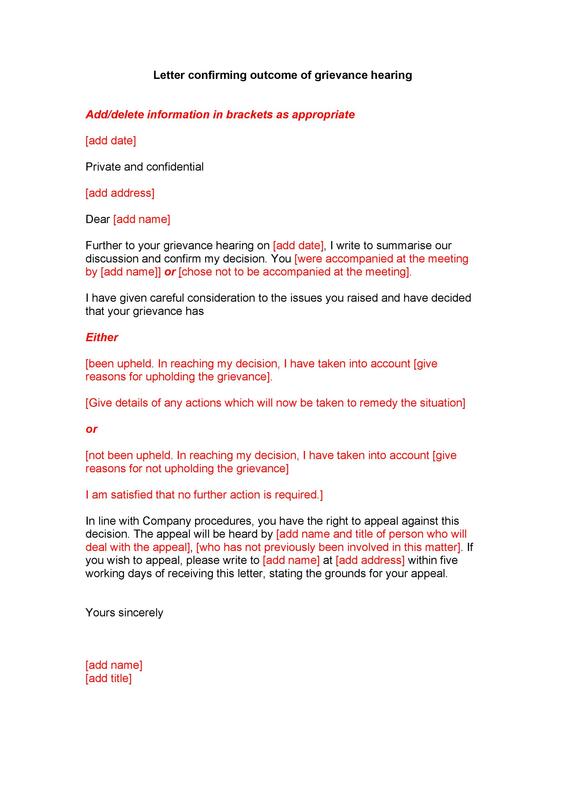 Any employee who wants to file a formal complaint at work should learn how to write a grievance letter. 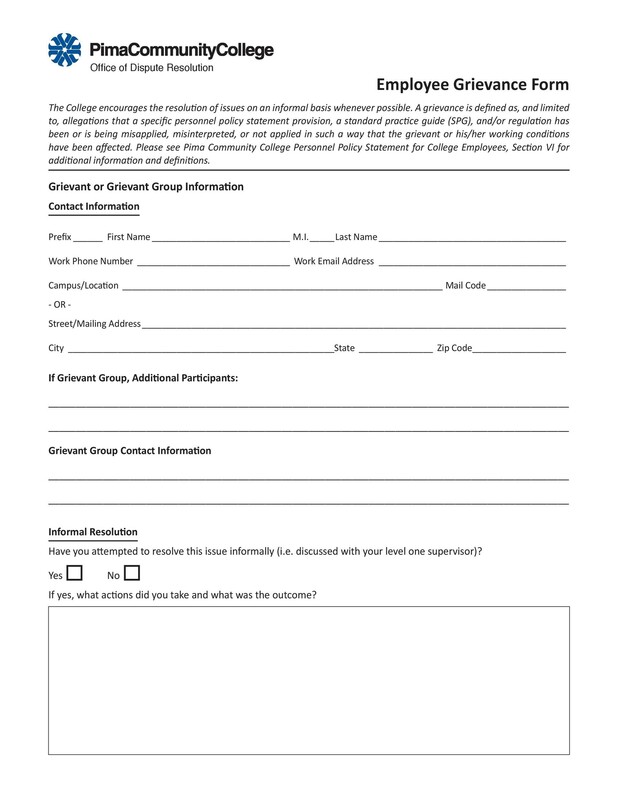 This is the first step to take if you feel like you need to file for a complaint or a grievance. 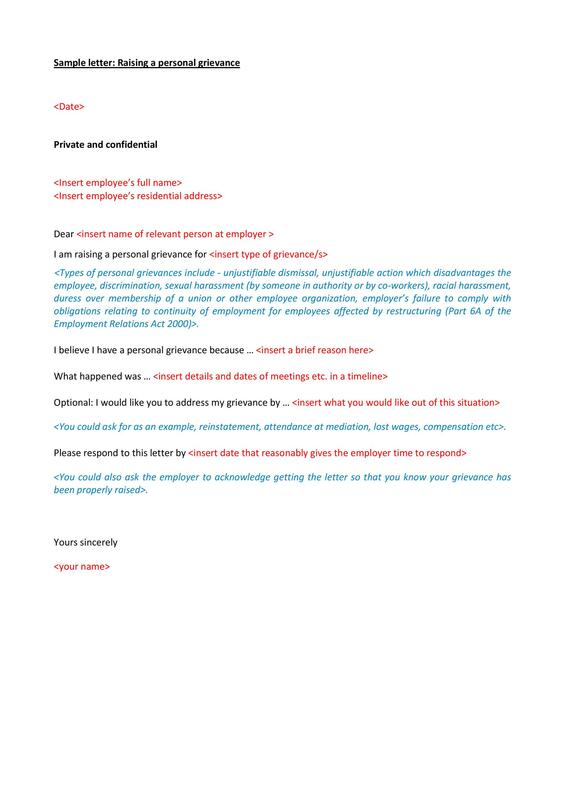 The letter should state your complaint in full detail so that your employer or the people in charge can start investigating your claims. Also, you can include any details of how you’ve tried to sort the problem out. 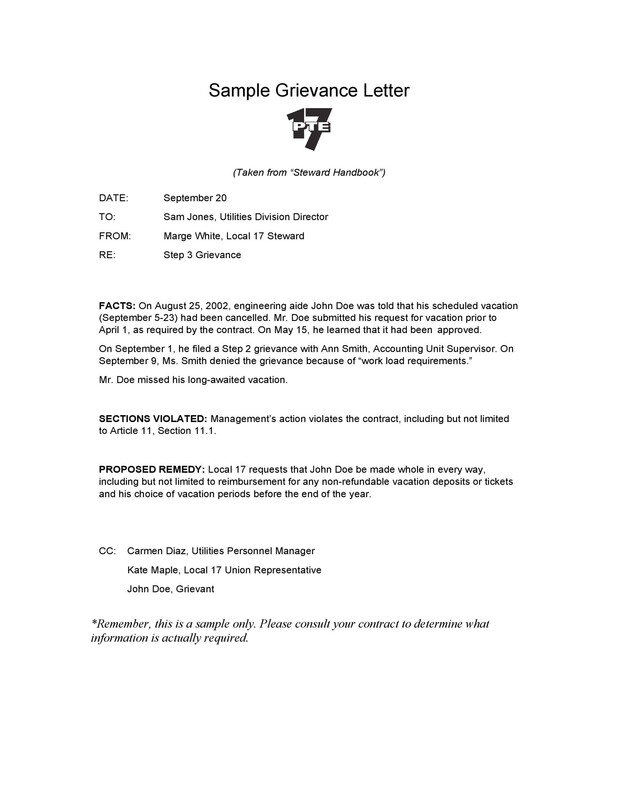 2 What is a grievance? 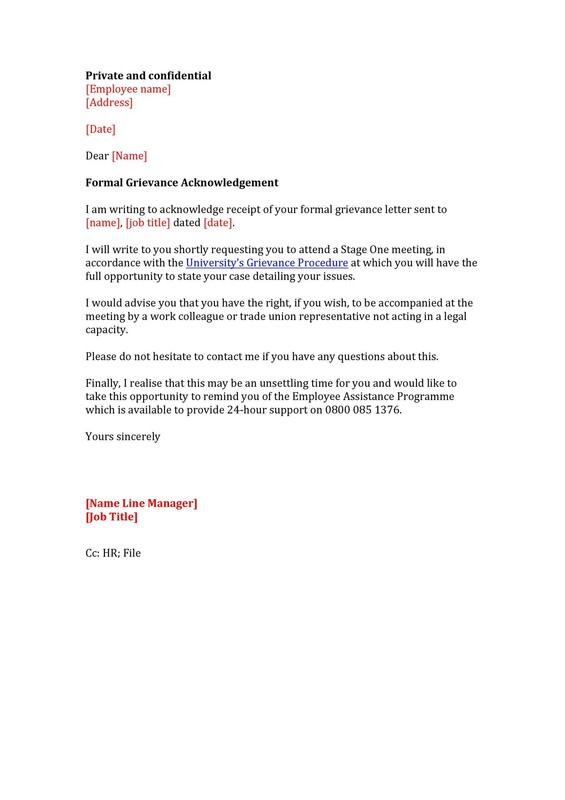 3 When to use a grievance letter? 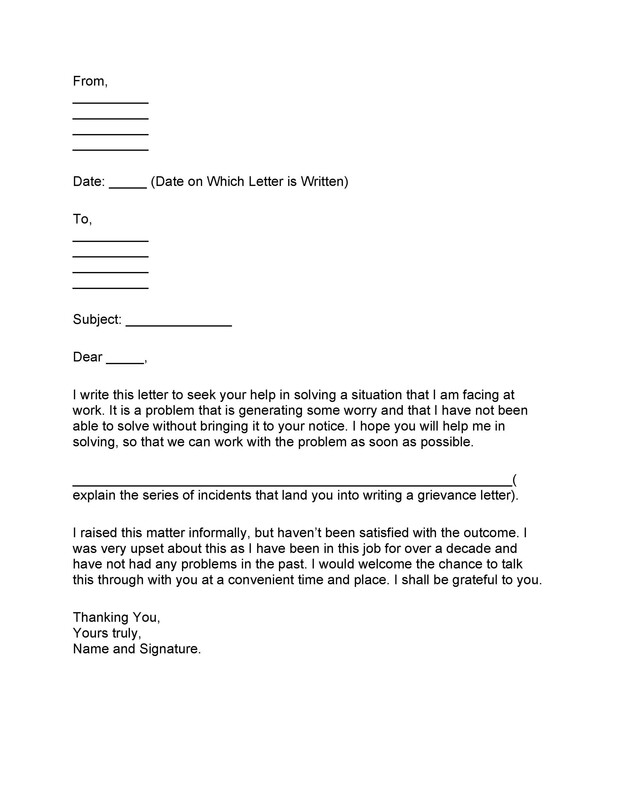 7 How to write a grievance letter? 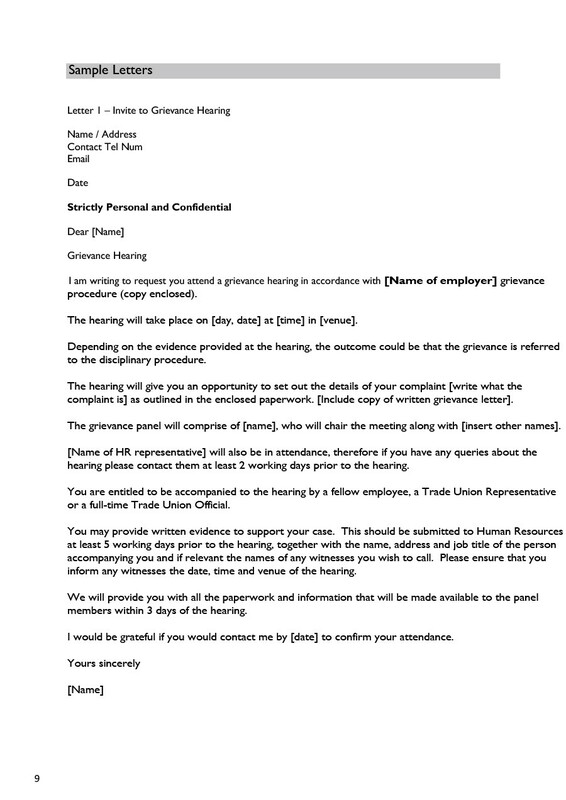 Any employee may write a grievance letter for unfair treatment addressed to his/her employer. 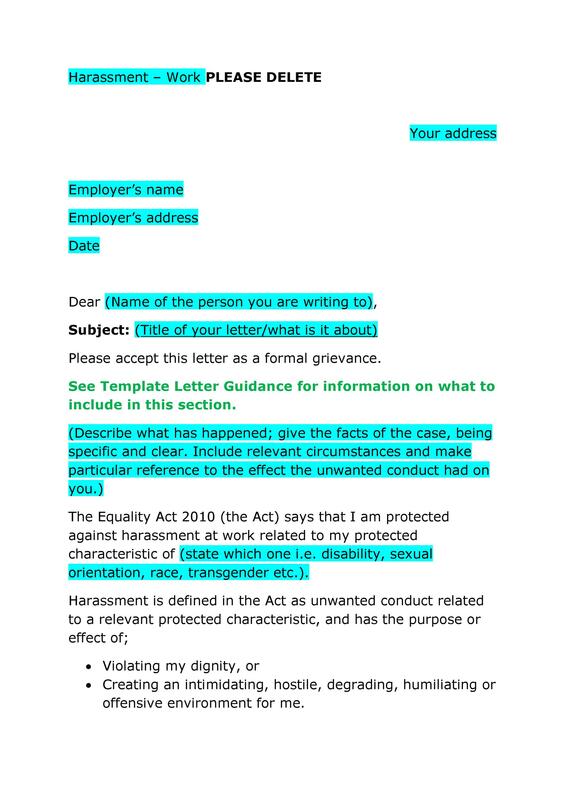 In this article, we’ll learn all about employment grievance letters, how to write them, what they should contain, and more. At one point or another, we may encounter a complaint or a grievance at the office. There are certain situations which may arise because of unfulfilled promises, unsatisfactory circumstances, and more. 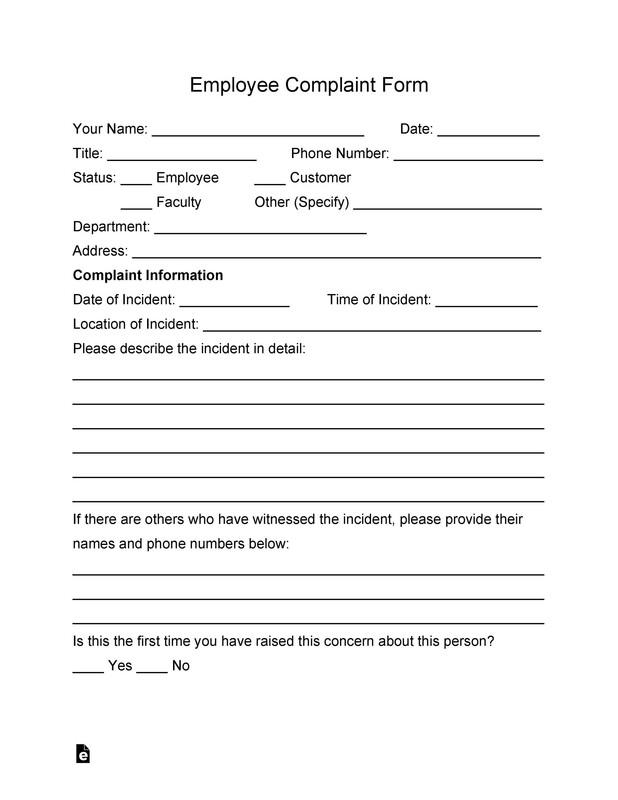 Simply put, a grievance is a complaint an employee has about something that happened in the workplace. Often, employees would raise a grievance if they experience issues with their salaries, issues with the company’s policies, unsafe conditions in the workplace, and more. Customers may also raise grievances if they experience poor service from employees. 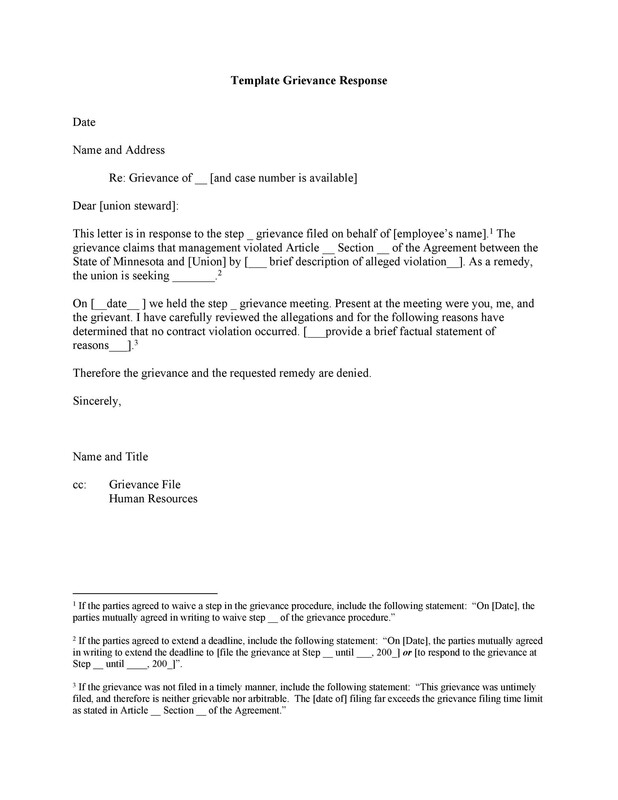 Grievances are formal complaints from individuals or groups, and they would file this complaint by writing a grievance letter. 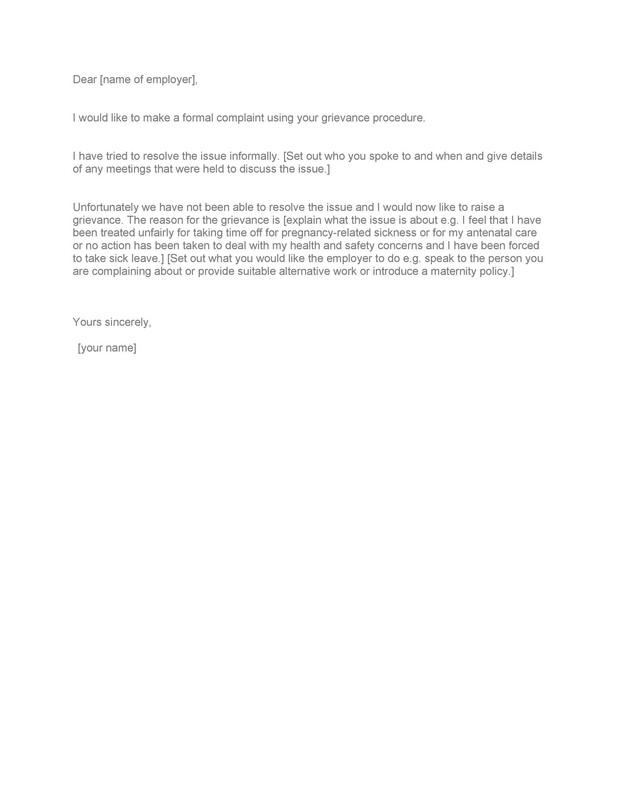 When to use a grievance letter? 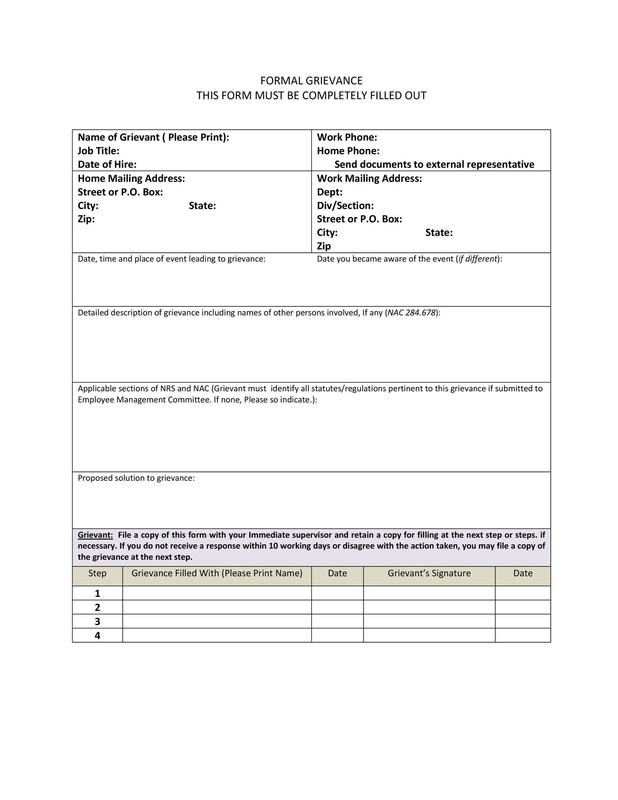 You and your employer can use it as a reference point for the exact time and date of the issue. 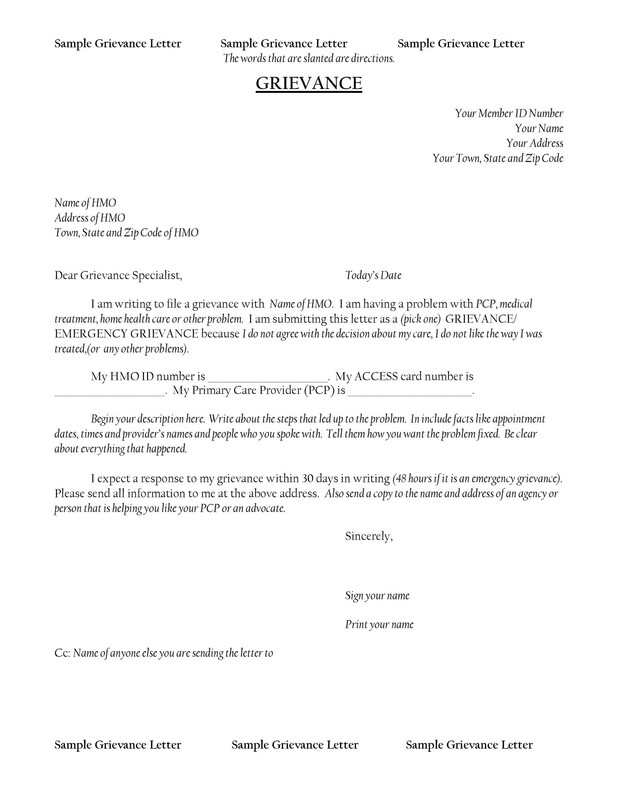 The letter can serve as proof or evidence if the situation escalates and involves the authorities. 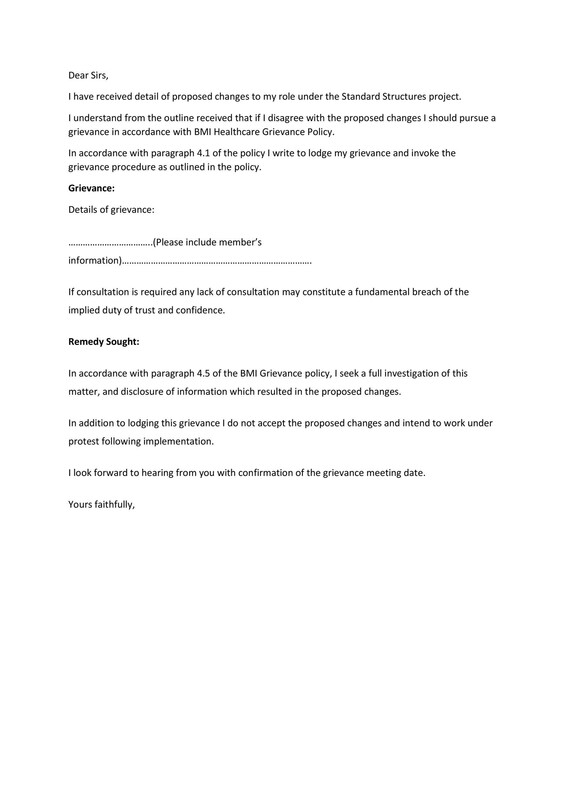 Keep a copy of the signed letter in your file for future reference or if your employers as you questions about your grievance. 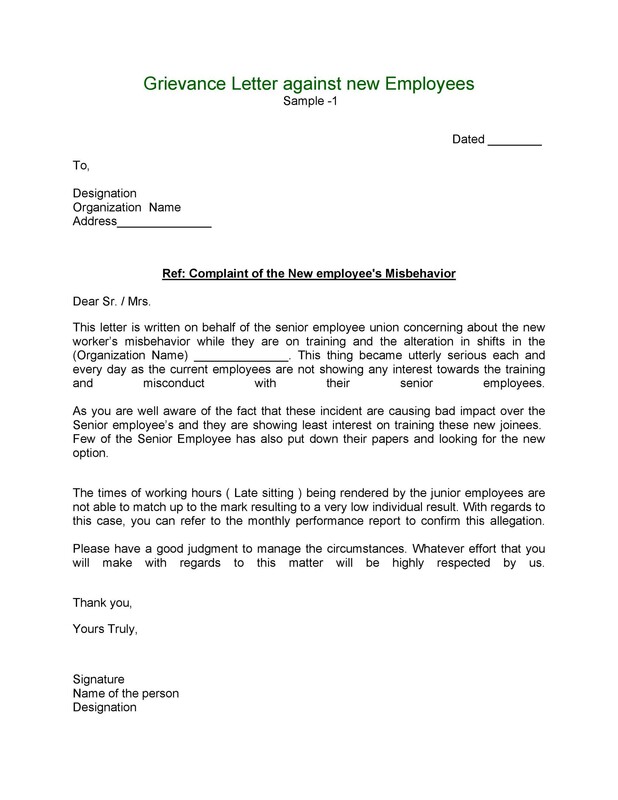 It will serve as a formal platform for you to deal with the issue at work or with the proper authorities. Stick to the facts and never make accusations or allegations when you don’t have evidence. Use professional language only, never use profanities, offensive or abusive language as this might put the reader off. Explain how the situation made you feel but try to avoid using emotive language. 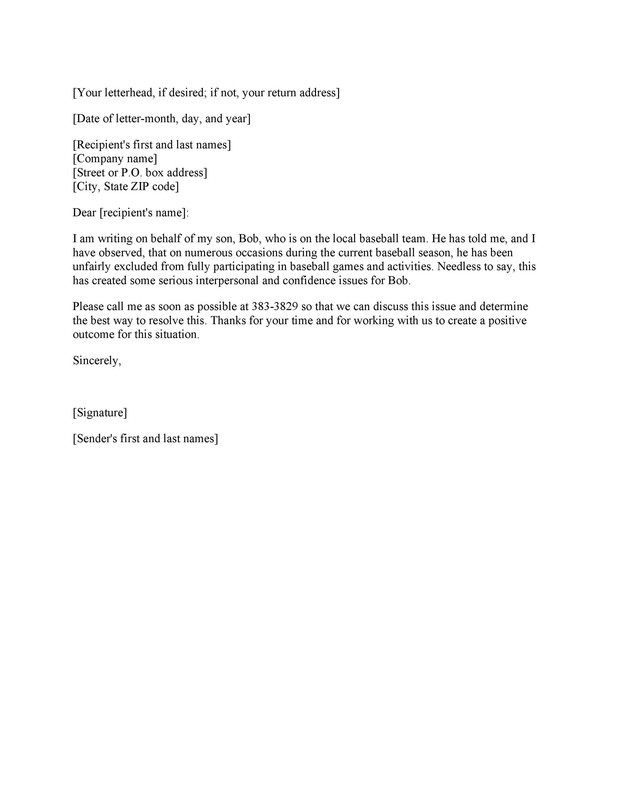 Address your letter to the appropriate person. 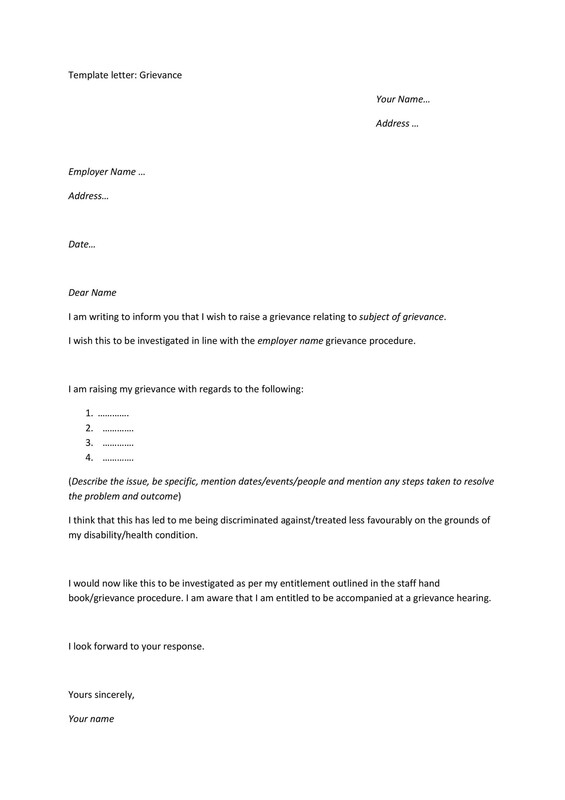 Check the grievance procedures of your company to learn how to write a letter and how to raise or file a grievance. 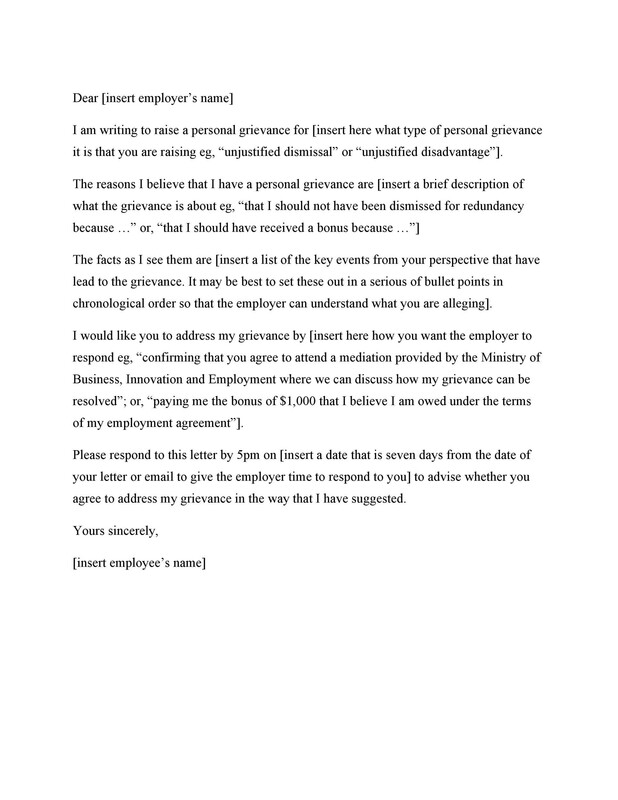 For instance, if it’s an employment grievance letter, send it to your employer. 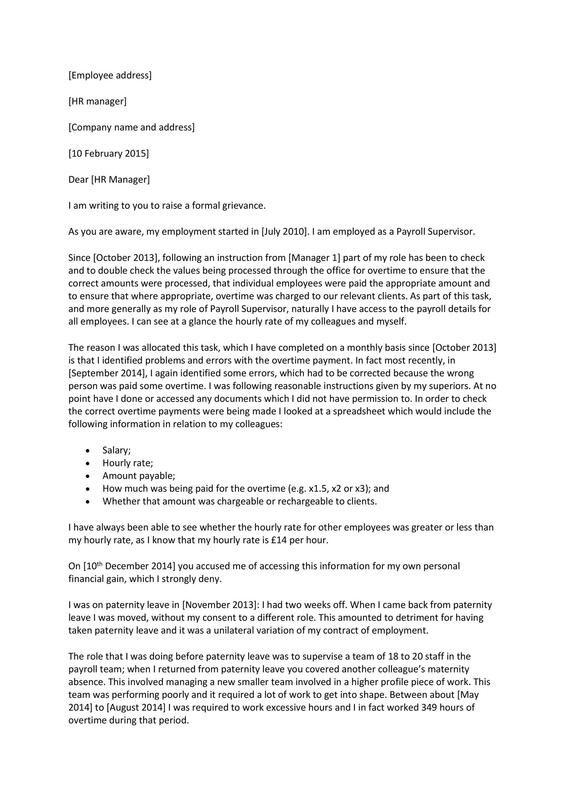 But if you’re complaining about your employer, send the letter to his superior. 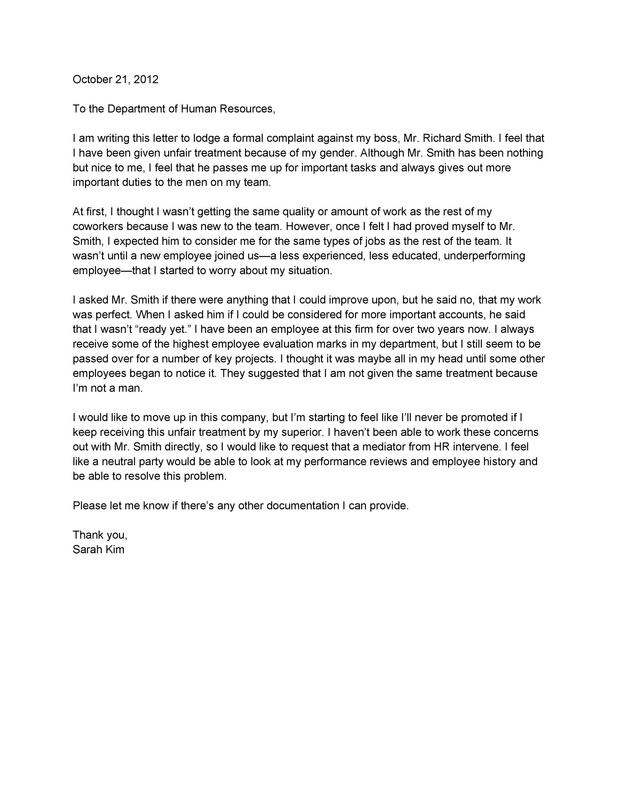 Also, send a copy of the letter to the HR department for them to keep in your file. Be as specific as possible. For instance, if you didn’t receive your salary or you feel like you haven’t received enough compensation, indicate how much you think the company owes you. 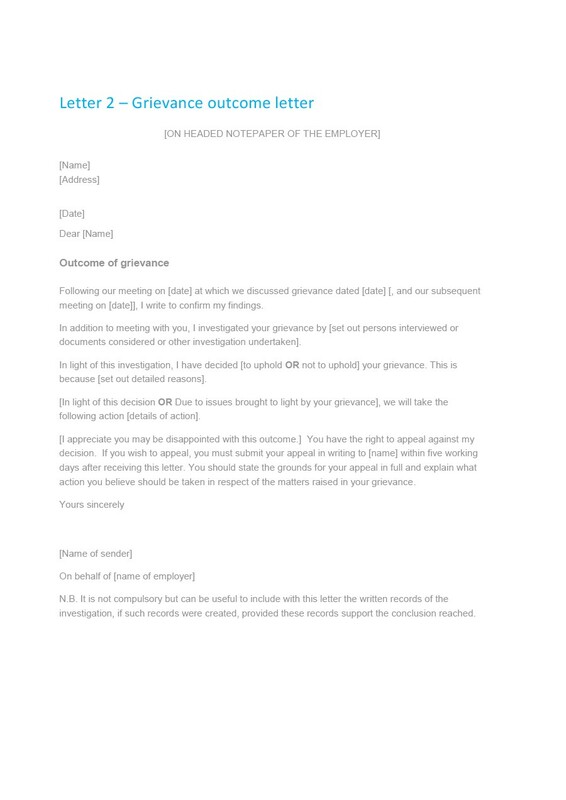 If your grievance is about different events, enumerate them in the chronological order. If you don’t remember the exact time and date of the event, talk about how the incident happened before or after an incident that you do remember. If you work in a large company and you don’t think your employer will know the names of the people involved in your grievance, try to explain their roles or indicate their job titles. Give a detailed description of the issues you’ve faced and how these have impacted you or your performance at work. This will make it easier for the reader to understand where you’re coming from. Mention any evidence which may support your grievance. 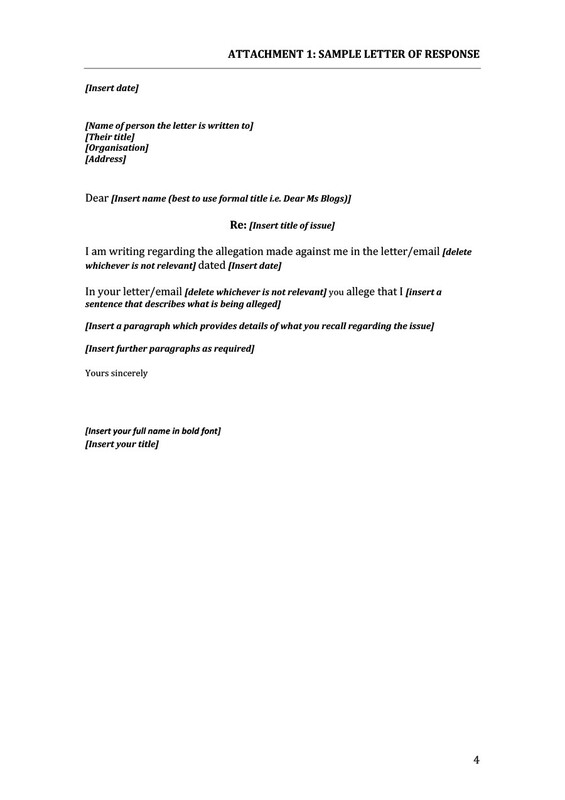 For instance, if you have any witnesses to back you up or you have concrete documents supporting your claims, include all of these in your letter too. Or you can say that you have the evidence and you can give it to them if they ask for it. Sometimes, giving a description of the problem isn’t enough. 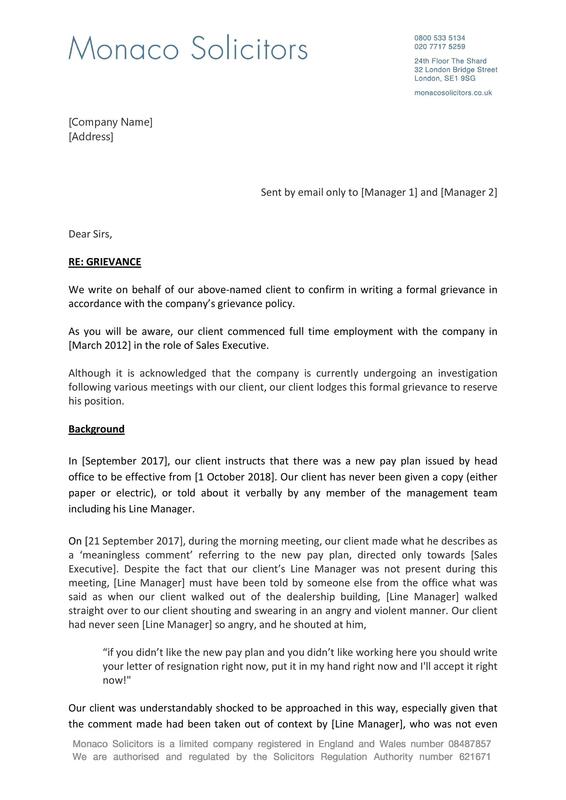 You should also give a suggestion as to how you or the company can solve the issue or the grievance. You may also ask for compensation if you feel that it’s appropriate. If needed, add a warning in the letter. 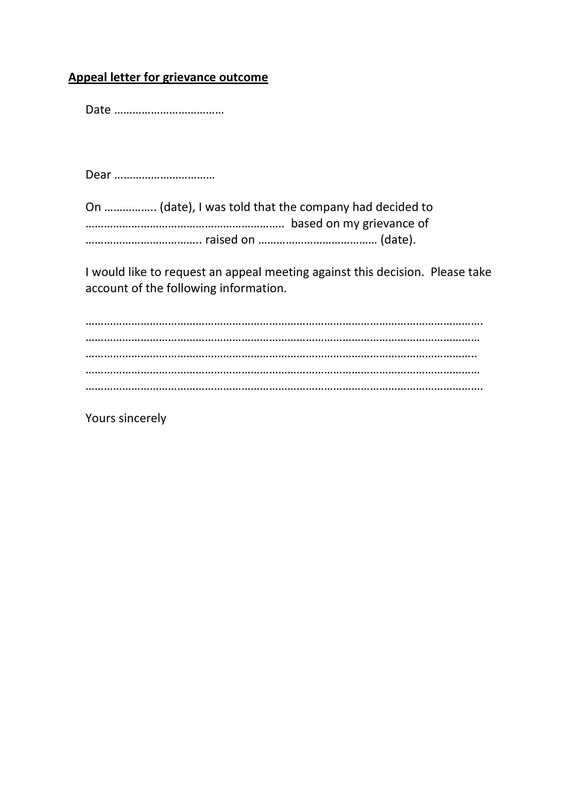 This isn’t a requirement in a grievance letter, but this may be important in some situations. When adding this statement, maintain your professionalism and never make use of aggressive words or statements. In some cases, you may have already tried resolving the solution but without success. Include the details of your effort in the letter too. Also, state why your first attempt didn’t work out. 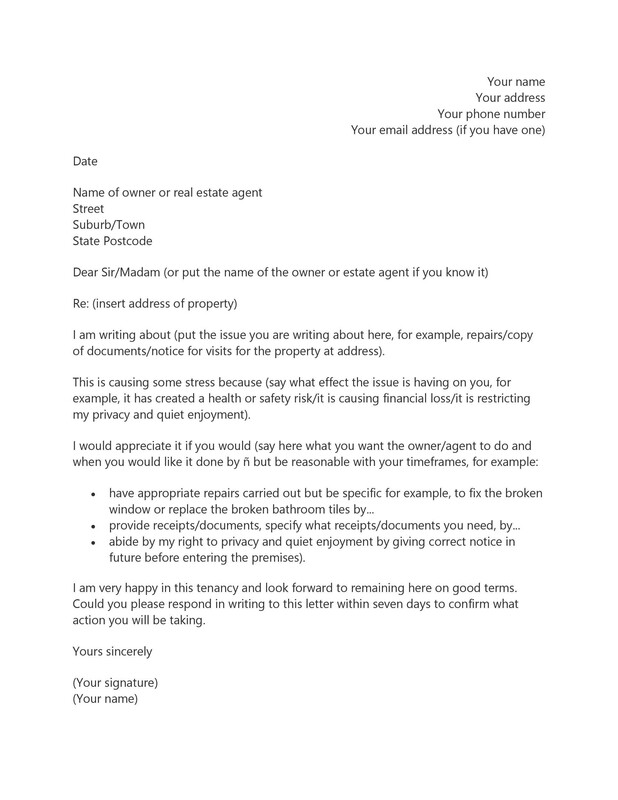 When closing your letter, use a polite and expectant tone. 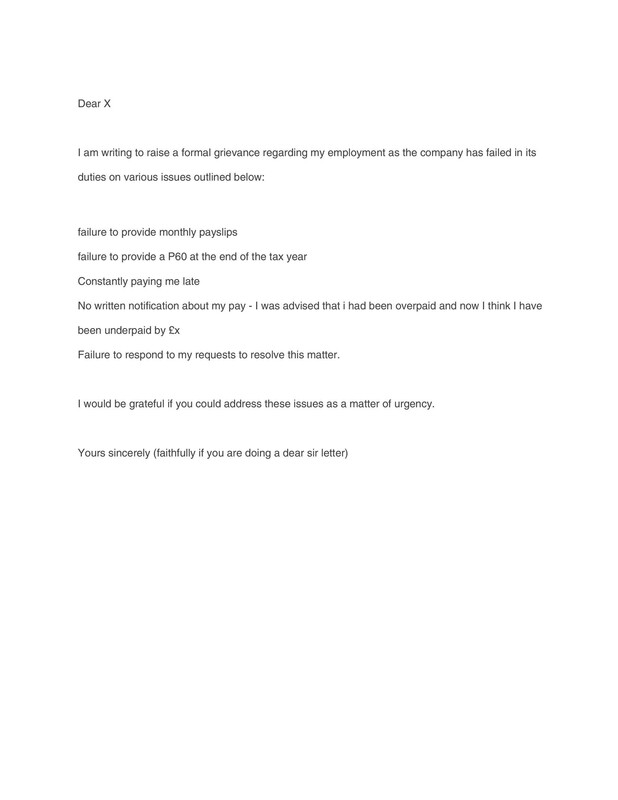 Write your last paragraph in such a way that your employer would feel compelled to answer your grievance. 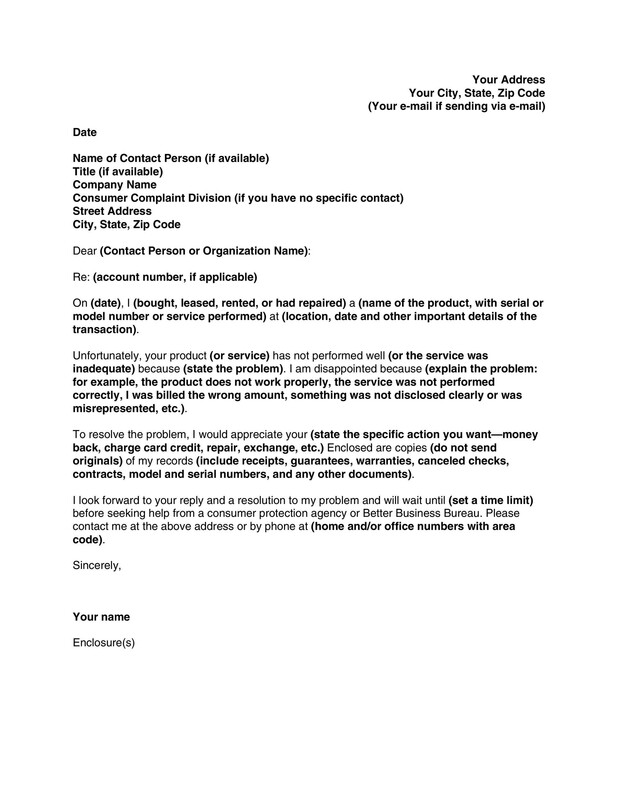 Proofread your letter before printing it out to make sure that it doesn’t contain any grammatical or spelling mistakes. 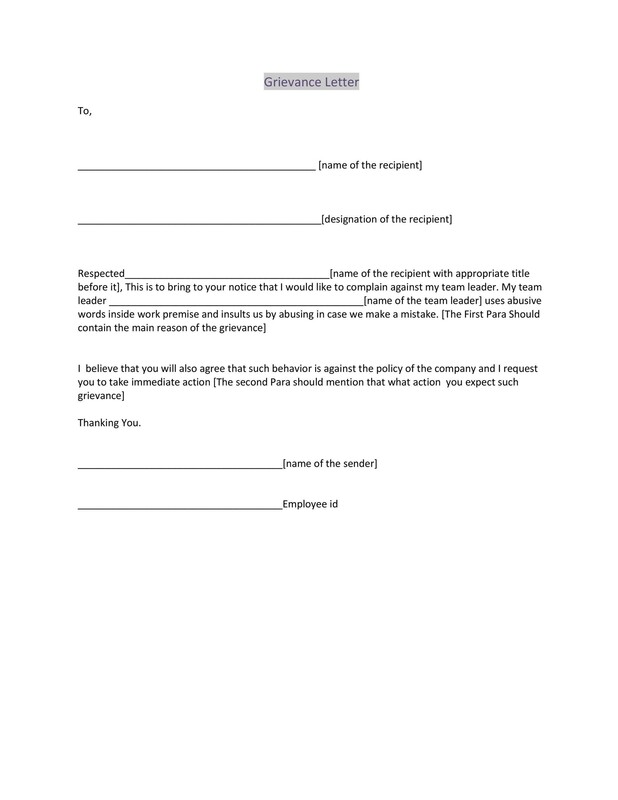 After printing out the letter, affix your signature, date the letter, and send it to the appropriate person. 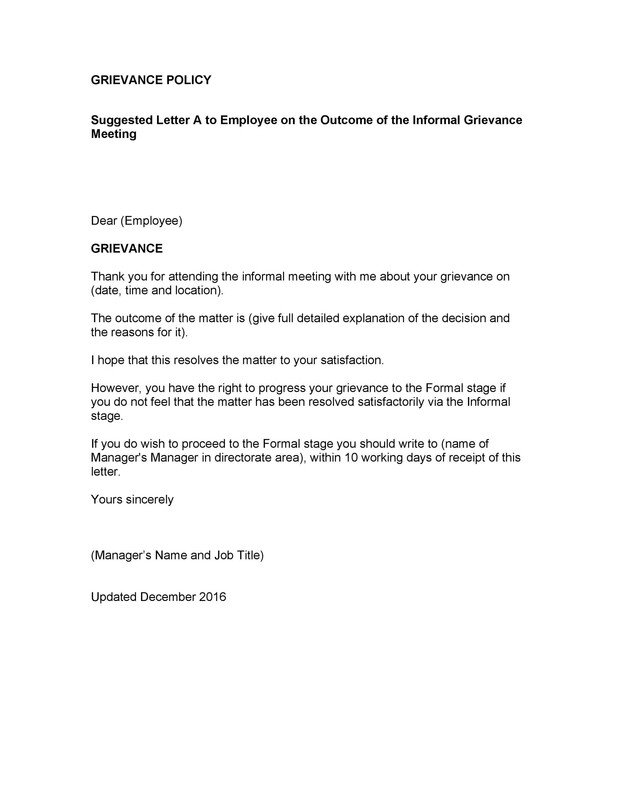 Why do you need a grievance letter?You need to write this letter if you want to raise a formal grievance about something you’ve experienced at work or in other environments. 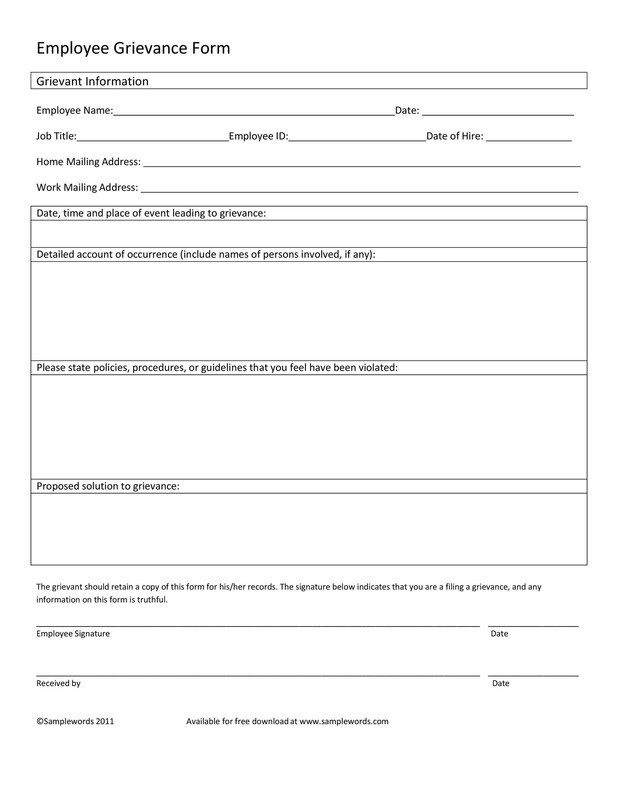 What steps should you take before you submit a grievance letter?When grievances arise, employees should try to settle them with their supervisors or managers informally. They can do this by starting a conversation with their superiors then work together to resolve the issue. 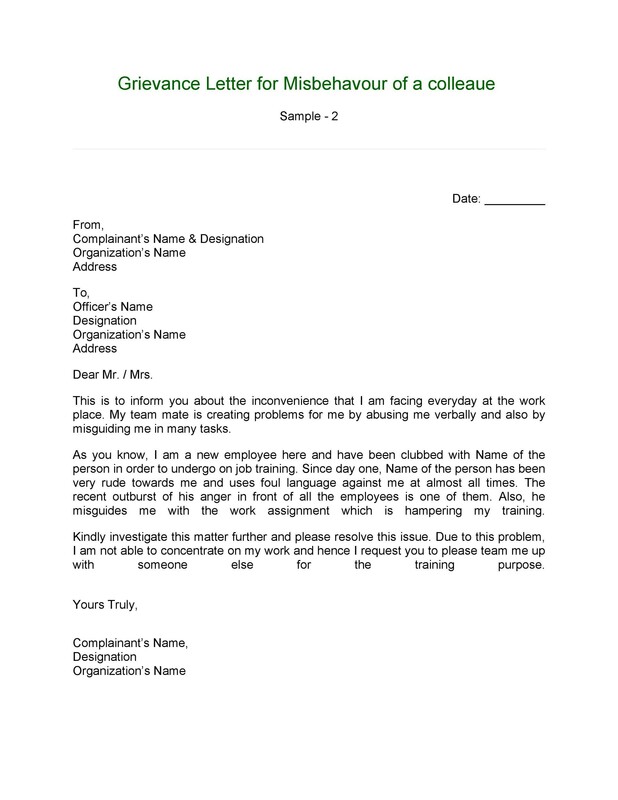 If the problem remains unresolved, then the employee may start writing a formal letter. 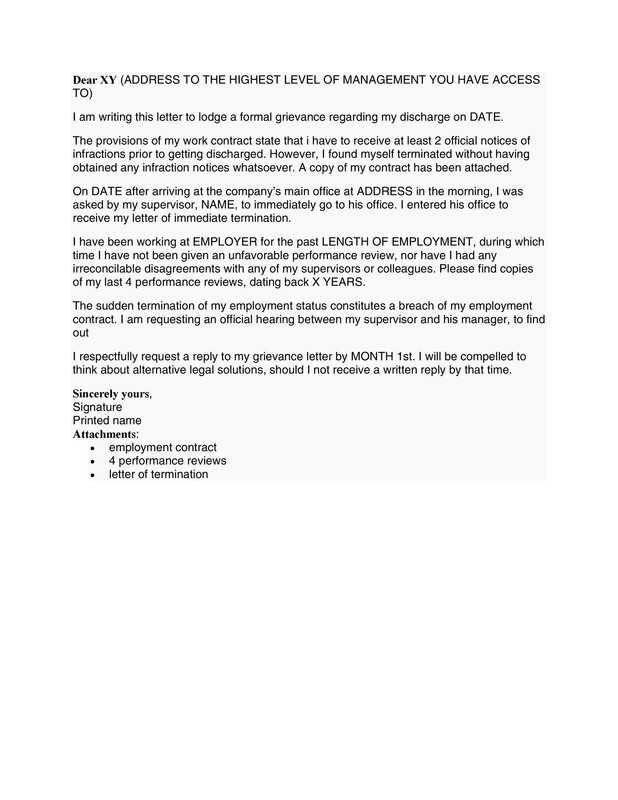 Is a grievance letter considered a legal action against your employer?This letter isn’t considered a legal action against your employer. 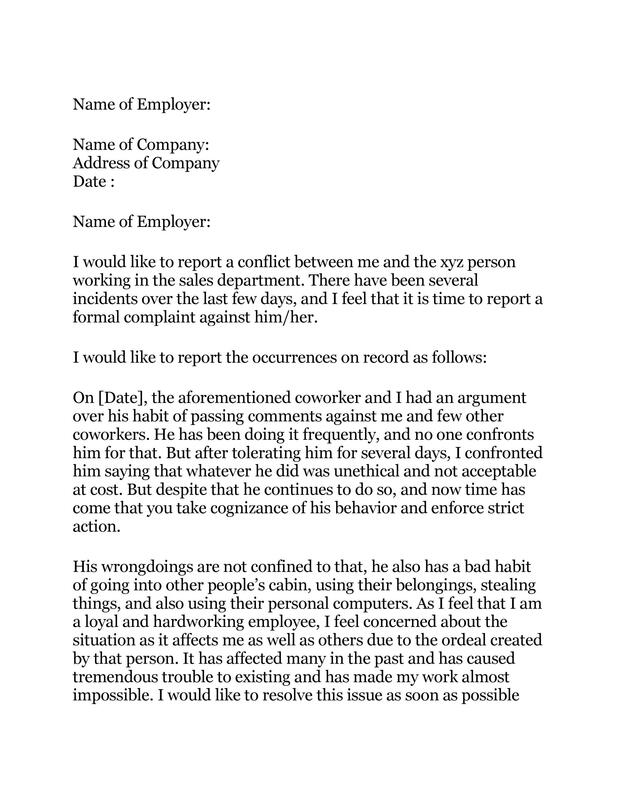 It’s just a formal complaint letter to your employer about any issues you’ve experienced at in the workplace. 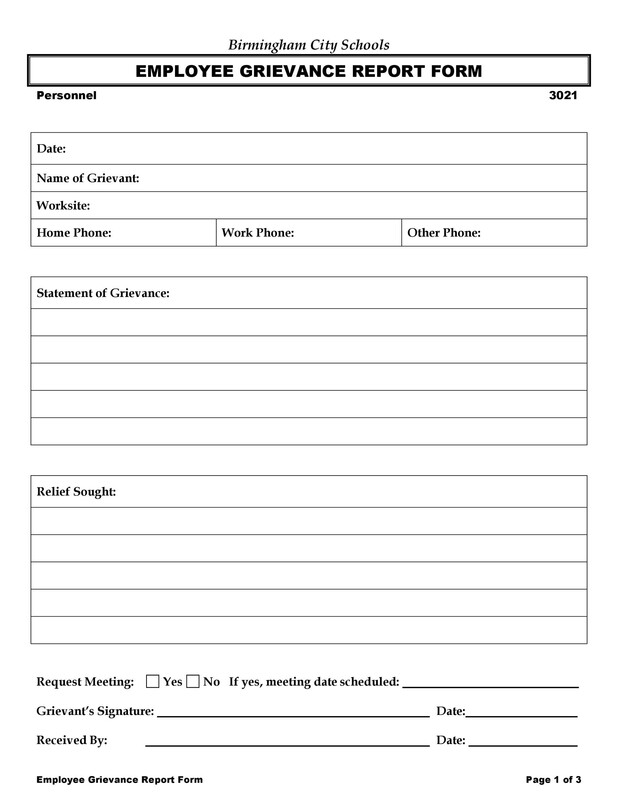 What would happen after you submit a grievance letter?Your employer should set a meeting to discuss the complaint with you. 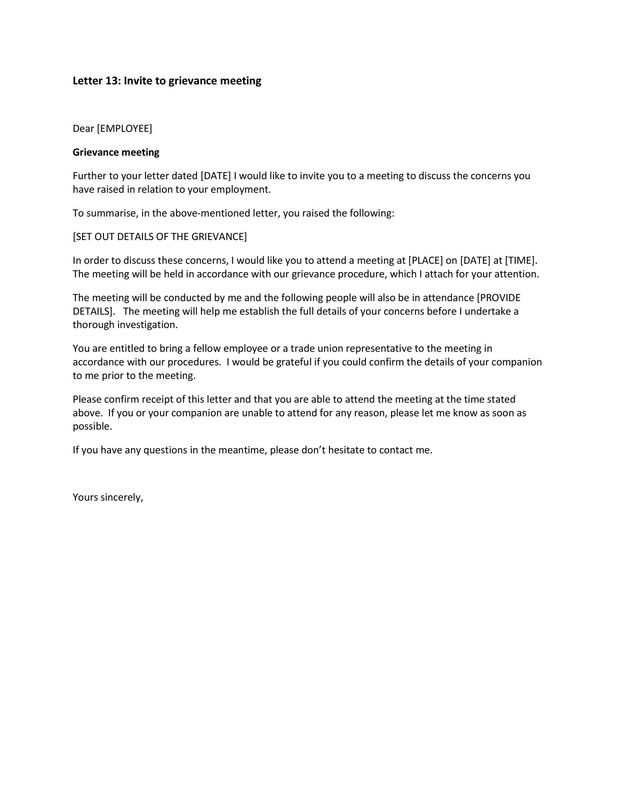 If you want, you can request for someone to accompany you to the meeting. The objective of this meeting is to find a solution to the problem.